Awesome encouragement today. I love how the Father takes practical things and show us such wisdom and knowledge.This was a much needed refresher for me. Thank you girlfriends. Thank you for this encouragement today. I am always more fearful than faithful. 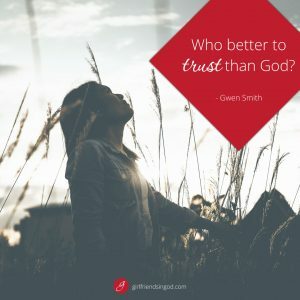 I am getting better at trusting that even if I make a poor choice and make a wrong turn or go a little faster than I should, that God is still there. God bless you Gwen for sharing your heart. Wow!!! I desperately needed this. I took a long-awaited new job this past August that has turned out to be nothing short of stress worse than anything that I EVER experienced or imagined. It’s been horrible. And I’ve been attempting to carry the entire load all alone. This devotional reminded me of a time when I eagerly anticipated uncertainty and how the Lord was gonna work it all out. I loved telling people that rolling with God was such a wild ride! I had NO doubts and I was fearless and I KNEW that God was gonna do something as cool as what I was asking for but likely BETTER. My faith was firm and strong and I stood solid and flat footed and confident in my faith that the devil IS the father of lies and that NOTHING he could conjure up could prosper because MY GOD WAS FIGHTING FOR ME!!! So what happened? I don’t know. God didn’t change. I got distracted. I listened to the wrong voices. I started thinking that I had to do it alone. Don’t know where that came from, either. God has been with me but the job is requiring me to live in a place of constantly dishing out “tough love” and dealing with people from a confrontational stance and that just isn’t who I am. Anyway…this is going to help me to reconnect with some favorite scriptures. God is in control! Thank you for this devotional and encouragement.